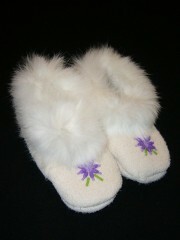 These gorgeous moccasins handmade in the Yukon will keep your little one's feet warm and cozy. Each pair is trimmed with rabbit fur and decorated with unique beading. Makes a great baby shower gift!